Hey, everyone. I know it's been a while since I posted, but I figured I'd show everyone the only hardware mod I've been gutsy enough to do on my MacBook. what do you all think? I hope to be posting more now, since I've now got more time on my hands. wow! that's awesome! how did you do that? What other colors can it be? Can you do purple? You just put a piece of coloured plastic inside the case. Not especially hard. I've done it on a friend's iBook before. 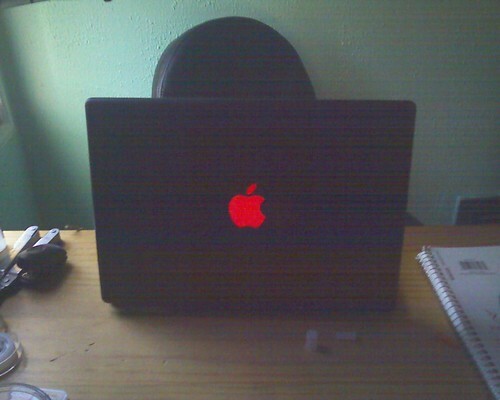 I thought Patrick Norton went a step further and removed the Apple logo from his Macbook Pro. I suppose he didn't want people to be distracted by the logo when in meetings and on camera. MBPs are desirable objects as well, so you don't want to draw too much attention to it in public. Anyway, wasn't there a place where you can mod your laptop with a custom exterior design (like a flaming laptop)? oooh be careful about the Speck covers. I've tried 2 on my MBP and neither fit sadly. I was really hoping it would work because as you know I am on a mission to try and toddler-proof my MBP. If you want to get a Spek cover, my advice would be to get it from the Apple Store and try it on in the store before you walk out with it. The first one I had on there fit, but not PERFECT and one side kept coming undone a little bit. For 50 bucks, I expected it to fit perfectly, but maybe I'm just picky. There were a lot of times where I'd find myself scooping up my child in one hand and my MBP with the other hand and it annoyed me that the one corner of the Speck case kept coming loose. The other thing is that I have one of those Huckleberry cameras that makes your built in webcam view the other way (what's in front of you) and wit the extra thick plastic on there, I could not mount the reflective mirror. Bummer. So, that's just my 2 cents, but depending, it might be worth more like 50.00 and some change. Isn't it strange that we find ourselves wanting to cover up our little precious and hiding the fact that it's a MBP because it's such a hot commodity? I totally agree and will probably also check into something more like an adhesive type cover, but I just find it rather amusing. Flaming would be cool, but I think it would be funny if I could make mine look like a sloppy peanut butter and jelly sandwich. What do ya think? I've even tried licking it to keep my 1 yr old away from it, but he's too young to understand that concept. Well, a gory puke-and-blood paint job would be fitting for this time of the year. However a peanut-butter-and-yelly paint job would probably be less seasonal. Their designs are just awesome.